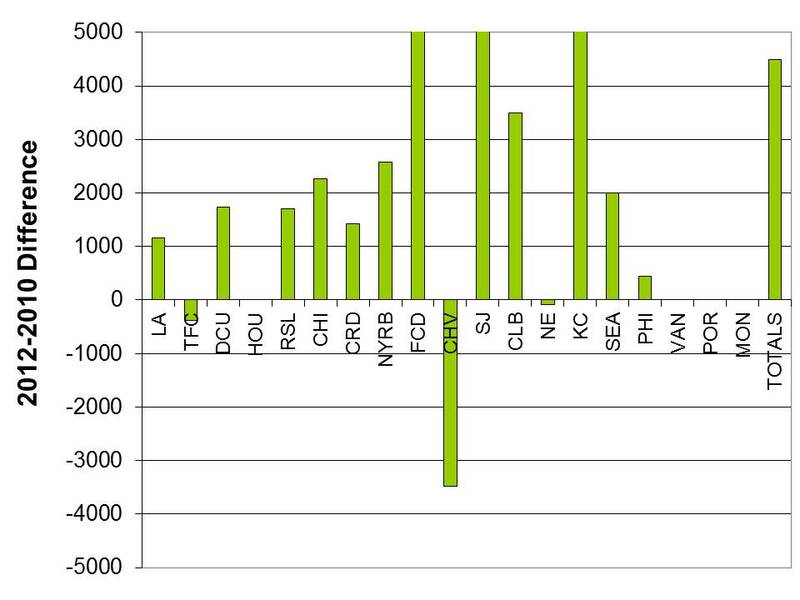 Welcome to the new MLS attendance statistics graphics for the 2012 season. 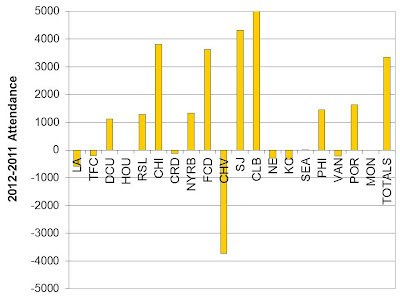 To complement the changes made by MLS in terms of unbalanced schedules, the weekly format of some of the plots (percent attendance, total attendance per week) have been removed and will no longer appear. Instead, more intuitive plots will be shown like the relative attendance median (a measure of the percentage of the stadium filled on any given week) along with the median and mean attendance values. There will be some sporadic supplemental plots in high-definition via the quasi-weekly updates. To start 2012, only Chivas seems to be having trouble from the start. Perhaps this is another sign that the club needs to change the way it's managed, change the structure, or move the team. San Diego seemed to be interested when I last checked. The Goats trail far behind their season average for 2011 and this should be the relative peak of the season for some of the more established teams. 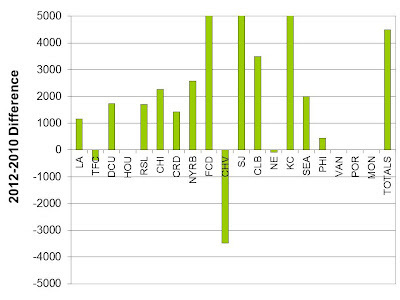 It's true that the novelty eventually wears off but the expansion markets seem to be doing pretty well even after a few years have passed: Houston, Salt Lake, Toronto, Seattle. The totals as seen on the plot above are bolstered by Montreal's record-setting opening day (58,912) at the Olympic Stadium. Their regular home at Saputo Stadium has a max capacity of around 20,000. 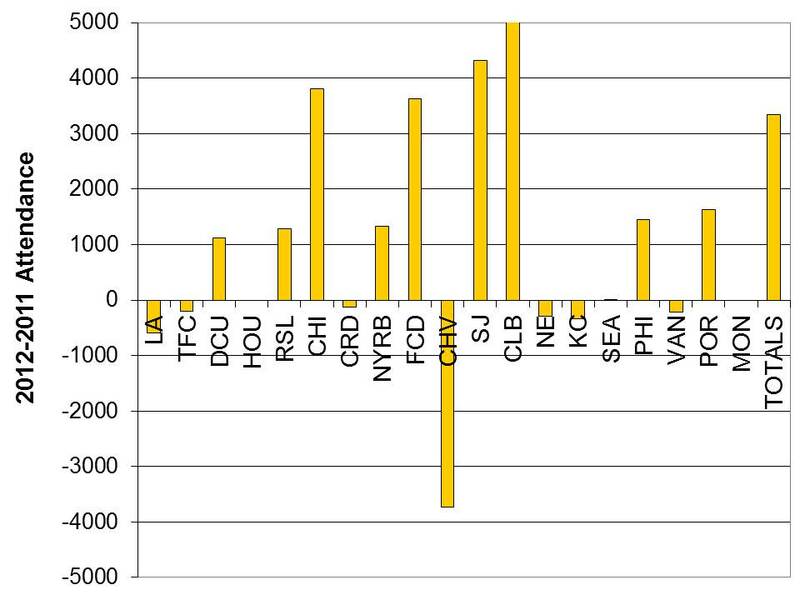 San Jose also chose to play outside of their Santa Clara home for their match versus Houston and their attendance reflects that when looking at the relative values. Also this season are Houston's stadium (22,000), the expanded attendance at Seattle (38,500) and Portland (20,000). Compared to 2010, the initial 2012 numbers look even more impressive. As the season goes on this difference should subside somewhat but attendance should have another record year this season. Canada wins, no Olympics for USA?